There are many external stimuli that get you in the mood, but the most SFW (and perhaps effective) is now served fresh out of MIT: a cool, sleek contraption that plays you various breathing paces and monitors your response to either relax, excite or, most importantly, turn you on. 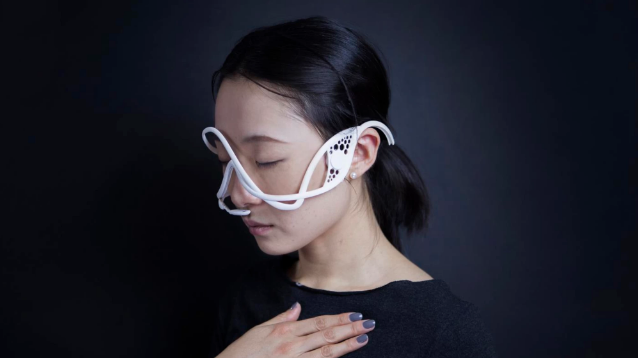 According to Motherboard, MIT Media Lab's Xin Liu teamed up with industrial designer Hongxin Zhang, drawing inspiration from Italian carnival masks to create Masque, the machine that measures your respiration and plays you breathing sounds through the bones in your skull so you're also able to hear through your ears without interference. The purpose of Masque is to decipher how other people's breathing impacts our own, with Liu noting when faster and/or heavier rates of breathing was played to participants, the more anxious they became (Liu marked the increase in anxiety post-experiment as "significant"). Alternatively, when the fake respiratory cues were slowed (think meditative), the wearer's psychological state became more relaxed. Most curious were the arousal capabilities of the machine. Liu recruited 12 heterosexual men and showed them photos of 14 different women for 30 seconds apiece, asking them to rate the images as to how exciting or attractive the women appeared to them. The results showed that the men rated the women more attractive when they heard "loud and fast respiration" that almost seemed as though they themselves were creating the breathing sounds. Liu hopes the Masque might become a way for the user to become more engaged in their external stimuli (be that a sexual partner or a piece of entertainment), but also be able to train themselves to control their emotions and psychological responses with breathing. "A more interesting conversation is thinking about how we can get more excited for situations too," Liu told Motherboard. "In the affection study, people found others more attractive. Maybe we can use Masque and the system in situations to make people more engaged, such as in movies and games." Naturally, the technology could prove very manipulative — especially if your Tinder swiping is soundtracked by some heavy panting. Otherwise the Masque is the only accessory you need for a Venetian masquerade ball.